Bhavna Naik, a Maryland, US based professional mehndi artist talks about creativity, dreams, and happiness. 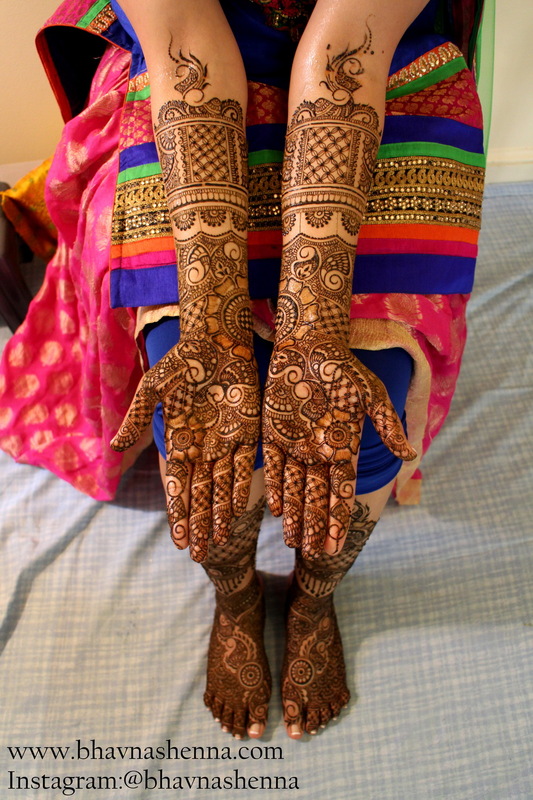 Bhavna Naik, a professional mehndi artist, a mother of two, has a Bachelors degree in the field of Commerce. She is currently based in Maryland, USA. Bhavna has done all sorts of jobs- from having worked in the healthcare sector to catering Indian cuisine, selling silver and handmade jewellery as well as Indian handicraft. But Naik is the happiest doing creative things, such as applying henna or teaching art to kids. While growing up as a kid in Mumbai, India, she would make greeting cards, do crochet, embroidery, paint stained glass art for gifting purposes. Applying mehndi to anyone and everyone during the summer break was her favorite past-time. And, that’s how she got inspired to start her own brand by the name of ‘Bhavna’s Henna and Arts’. 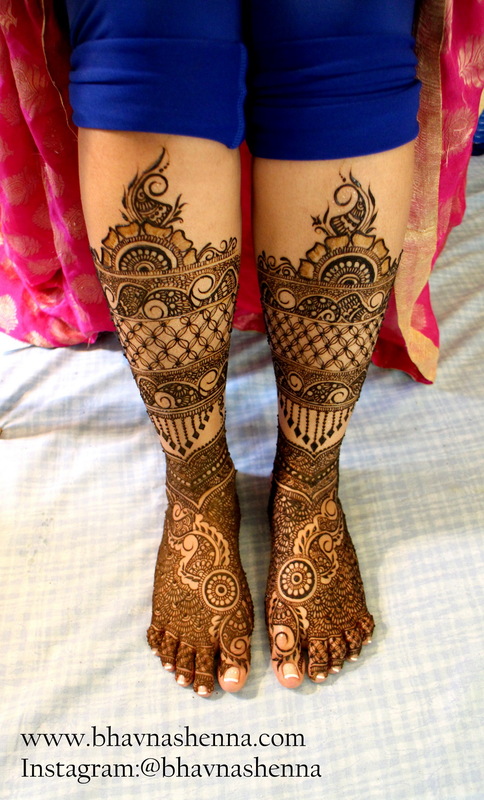 Let’s get to know about her and also take a look at some of her gorgeous mehndi designs! My name is Bhavna Naik, I am 40 years old, a mom, a wife and a professional henna artist. Growing up as a kid in Mumbai, India, I was very creative from the age 8 or 9 in arts and crafts in different mediums. I made greeting cards and applied mehndi designs for my friends and neighbors. One day, 4 years ago in 2012, a friend asked me- “What is the one thing you would do all your life and be happy?”, and I answered “HENNA”, that’s the day I decided to start “Bhavna’s Henna & Arts”, my own mehndi application business. Never did I imagine that my hobbies would drive me to reach my financial goals and dreams. My most favorite mehndi designs are the ones that are structured and have enough negative space for the main focus elements to be visible. I do love doing the mandala on the back of the hands to look like the “haath phool” jewellery that brides wear. I also love drawing figures. One of my brides asked for the Sangeet night depicted on her arms, with a hidden message of humor and fashion, and her fiance’s favorite sports team – “the 49ers”. So this was my most favorite design. 3. Most memorable experience you had while doing henna designs? Something that has stayed close to your heart and is remembered very fondly? All my brides have been a sheer joy to work with, and every one of them have become lifelong friends. But my most memorable would be my second bride Ashley Singh. This was the most memorable because “The Washington Post” called me a day before to interview me for Indian bridal henna traditions, and when I told them that I was doing a bride the next morning, they accompanied me to my bridal appointment. A reporter interviewed the family and guests and the photographer took pictures of me working on the bride. They did a story on Indian bridal henna with me and my bride featured on their print version and their online version of the newspaper. That was my most memorable mehndi design. For achieving a good stain, it’s not only important to take care of the mehndi design after it has been applied, but to prepare your skin before the application of mehndi is also important. One day before henna: Remove any hair from the skin, exfoliate skin to open the cells to receive mehndi design. Manicure and pedicure needs to done on this day too. On the day of henna application: Oils and/or lotions should be avoided, they block the mehndi design from permeating through the layers of the skin. 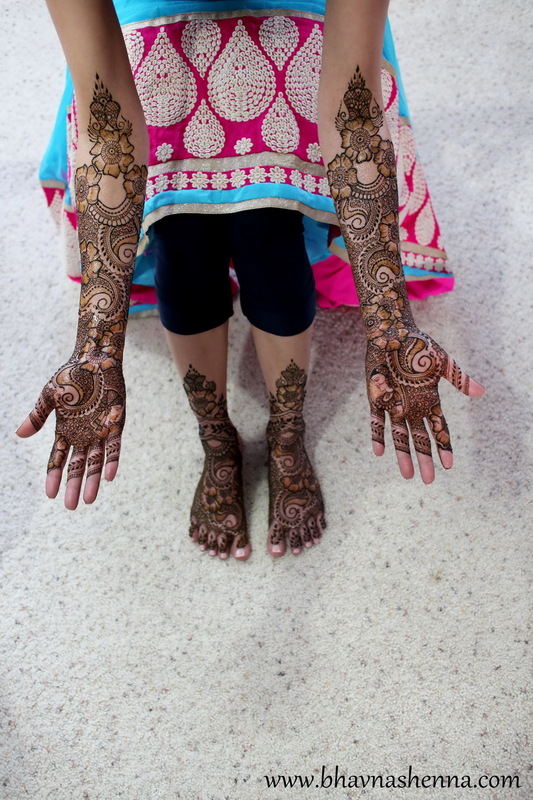 After henna is applied: The goal is to keep it dry on the skin for a good 8 hours, this allows the mehndi design to dry naturally and seep in to the layers of the skin. It is also important to keep your body temperature warm by sipping on warm liquids, this will help with attaining a better stain. After the 8 hours when henna is scraped off, it’s good to either dry roast your arms over a pan of cloves, or just use any oil or balm to protect from water for another few hours. When henna is scraped off it looks orange in color, it needs 24 to 48 hours from that point to reach it’s peak stain. To conclude: My most sincere advice would be to add a bit of creativity to your world either by creating art or being part of the process or be on the receiving end of mehndi design and you will see your soul smile for the very first time. Also an advice to brides, when henna is being applied – be mindful of its calming ability, don’t get distracted by the hulla-gulla (hustle-bustle), this is the only time to relax and feel royal before the festivities begin. The best way to reach me is through my website or via email bhavnashenna@gmail.com You can also visit my Facebook page or follow me on Instagram!